Because of the controversy last week about whether Northamptonshire is windy or not I have mapped and ranked all of England’s Local Planning Authorities (for Plan Making Purposes) below. For each grid square of 1Ha for each LPA I took the wind measure for that area (which is at 1km resolution). I made some technical adjustments so the two datasets didnt overlap which would have created distortions where LPAs have sea areas. The LPA areas calculated are for land areas with modelled wind measurements only. I then took the mean windspeed for each LPA. Ranked as follows Isles of Scilly easily the windiest, followed by Northumberland NP, Barrow-In_Furness, Exmoor NP and Blackpool. Perhaps Blackpool should go for wind turbines rather than Casinos. The least windy, Chesterfield followed by Stockport. So it wasn’t the wind that did for that spire then. The ranking is graphed as follows showing that there is very limited variation at LPA scale, all of England is pretty windy. Given that turbines cannot operate at very windy conditions this evens it out still further. Finally a scatter graph of NPPF constraints (other than Green Belt) against mean windspeed. This shows that the most LPAs have large areas without constraints, which means, together with the average wind data, that there is no reason to allow windfarms in the most sensitive areas such as AONBs etc, as there are plenty of areas outside them. Of course the logic of this is that areas with high levels of constraint such should have less and the capacity shortfall should be made up to some extent for in less constrained LPAS/Regions. Although this isnt necessarily what places like Northamptonshire would like to hear. 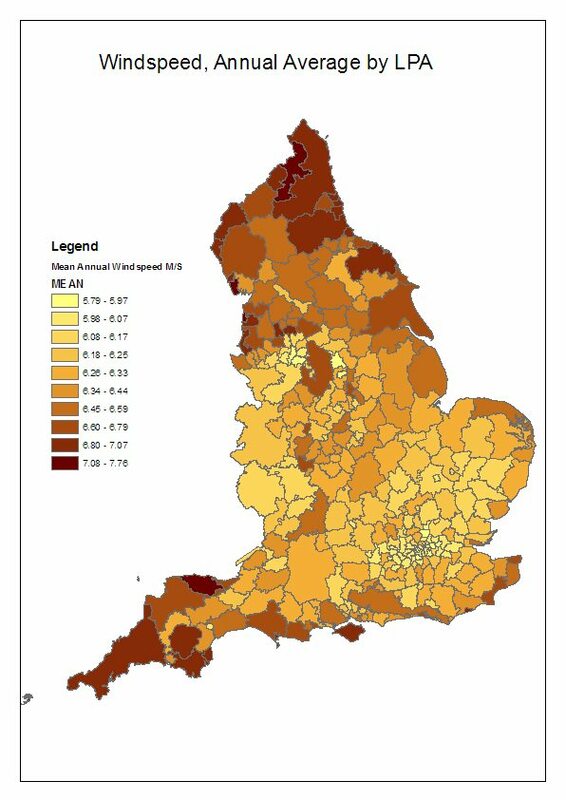 Under the Duty to Cooperate LPAs with high nationally protected area coverage like Cotswold District and Wiltshire could quite rightly argue under the Duty to Cooperate that the fair share for places with less coverage nearby but still windy should take more, such as Basingstoke and Deane, Cherwell etc. And the outcome. West Northamptonshire ranked at 120 is above national average, flatter North Northamptonshire is 179 just below the National average, so bog standard windiness in other words. I live smack bang in front of the sea – nothing between me and it and it being about 20m away with France the next stop. A district average wind speed means absolutely nothing to me – you can be two streets away from where I live and the wind speed can be minimal when I am having the breath sucked out of me at the front door! Actually, some of the blocks of flats are more than 45m high! But take your point – however, the maps are really no help as the wind speed varies so much from place to place in smaller areas than districts. Thank you for taking time to put this together. I’ve read this article with ‘where to live in England’ in mind – I’m aiming for least windy and rainy and most warm in summer. I’ve lived in a few places in England, also Edinburgh in Scotland and for the past 6 years, Moray in Scotland – both windy and not so warm in the summer. Time for a change! I live in Southport North of Liverpool. I can tell you that here in the winter and from October onward it gets pretty darned windy!! 70mph is normal and more…I HAVE noticed that if the winds are Southerly then the North Wales mountains seems to deflect there power? When 70-80mph are forecast but are coming from a Southerly direction it’s usually only ‘breezy’ here. Westerly winds are the deadliest for us…and N.W winds. Great news for the roofers in the area…not for the rest of us…sigh.